Round 3: Steve vs. Amy in "Ticket to Ride"
It's time to post an update on the ongoing scores of "Steve vs. Amy" Ticket to Ride games! Whenever we play a head-to-head game, we update the ongoing results table on our guest bathroom wall, which features chalkboard paint. Our guests are always quite amused when they take a look! To be honest, we haven't been playing Ticket to Ride at the same pace that we had previously. Our passion for the game hasn't subsided, but rather with Amy being pregnant and frequently tired, we just haven't had the time in the evenings to play like we used to. 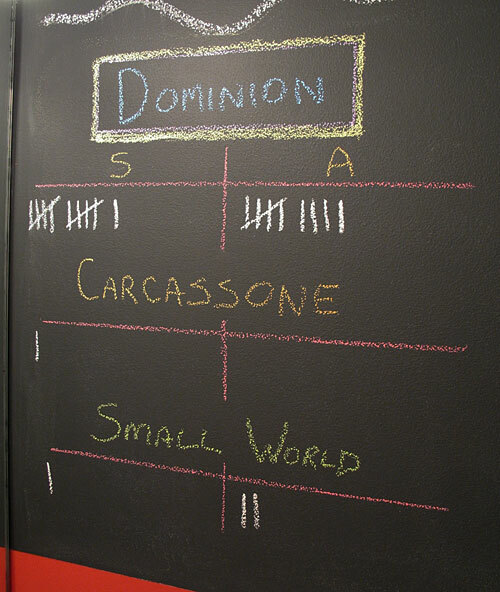 That said, we also recently picked up the game Dominion, which we really enjoy. It plays quite fast, so when time is an issue, we tend to play this instead. We're also experimenting with Small World and Carcassone a bit, albeit in their digital iterations. But let's get back to Ticket to Ride. In our last update, based on the number of appearances in the list, it was obvious that we picked up the Alvin & Dexter Monster Expansion, which is still very excellent. This time around you can see the trend of playing a lot of the currently out-of-print Switzerland map (which will be returning with the new release of Ticket to Ride Map Collection: Volume 2 – India & Switzerland). Of all the Ticket to Ride maps, I find the Swiss version to be the most "broken" in how it works (though Alvin & Dexter can fix some of that). We also recently picked up Ticket to Ride Marklin, which is the Germany map, and probably the most complex in the series. We are liking it quite a bit! The last entries on the chart are digital interpretations of the game, Ticket to Ride for the iPad and Ticket to Ride Pocket (for iPhone & iPod Touch). I recently was issued an iPad for work use, so we've been able to test out these iOS versions. Both are impressive! In this latest round, we played a total of 15 games, with Amy winning 9, and myself the victor in 6. 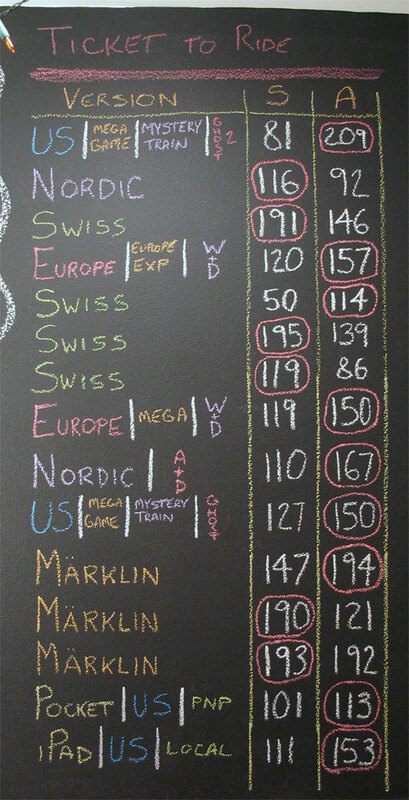 Amy continues to dominate Europe, while I tend to have the advantage when playing Switzerland. Factoring all rounds since we started keeping track of these statistics, Amy leads the series with 25 wins to my 22.